How to Make your Tap Water Safe and Healthy! A little dramatic, perhaps? The truth is for many of us living in modern first world countries, the accessibility to drinkable water is a staple part of our day to day life. We take it for granted. Go to the kitchen, turn on tap, pour, drink. That said, the process in which the water is treated in many parts of North America could be better and as we see in the press almost every day, even in some of our “top” cities there are water safety issues. The bottom line is that having unlimited safe, pure and tasty water takes a little more than most cities are providing but it is well within the capabilities of modern drinking water filtration systems such as those provided by MineralPro. Safe Drinking Water – where our product comes in. We can simplify the definition of reverse osmosis by pointing squarely to the facts. 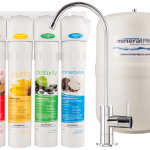 Mineral Pro’s purification technology utilises a semipermeable membrane to remove molecules, ions, and larger particles from drinking water that are otherwise left untreated, even in some of the more advanced treatment centres across the country. Our industry leading RO system ensures that you are receiving only the practical and healthy components in the water and not the potentially hazardous materials that can find their way through to your tap. Often it is tragedies like that of Flint, Michigan, that allow communities to come together and take a meticulous look at what we are really doing to make our lives the best they can be. Access to safe drinking water is a key component of our well-being. Without access to properly treated water, we are put in a position where our health wellbeing deteriorates and our lives become more difficult. Again, rather simply, we can state that the need to have access to fresh and clean water is a priority. Our process does not reinvent the wheel, as it were, rather it approaches this need for purified water with a diligence that intends to impress and bring value to your life. We want you to feel better every time you take a sip of water treated through our products because you know that you’ve gone in the right direction and taken control of what you allow into your body. Reverse Osmosis is a powerful tool for creating water that is high-quality and contaminant-free. As a naturally-occurring process, you can no doubt appreciate why we are passionate about promoting it and informing consumers about how it can positively impact your life. Our system operates in a step-by-step capacity, moving from a cold water line valve through to a pre-filter device. This five-micron sediment filter traps a wide range of sediment and particles from dust to rust to silt and beyond, to improve the quality and the taste of your water. This is followed by a pre-carbon filter that reduces and eliminates elements including chlorine. 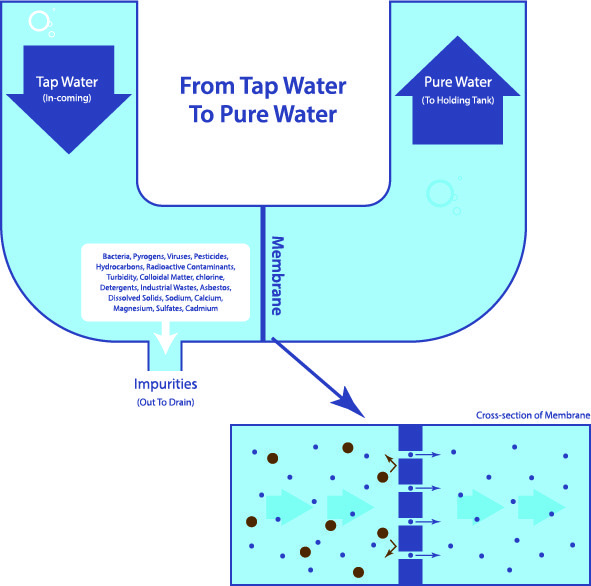 Water flows into our Reverse Osmosis Membrane that operates as the heart and core of the purification steps. Here the semi-permeable membrane removes minerals and material such as salt, bacteria, viruses, pesticides, hormones and a whole lot more. The following completion steps provide additional mineral balancing and stabilising of alkaline, pH, and provides water with a significant boost towards the “super” healthy side of the spectrum with additions in magnesium, sodium potassium, and calcium. If you like comic book superheroes then think of Mineral Pro RO filtered water as the Superman or Wonderwomen of waters! Add to this the fact that the WHO has specifically investigated the relationship between health and demineralized water and you can certainly begin to appreciate why there is such a strong movement to make pure water more accessible in areas of the world where poverty exists and where modernization attempts have only recently begun. While there are many products out there that will provide you with water that has been cleaned, it is important to note that the terminologies utilised are often over-generalized. This is to say, many companies do not provide a stage where minerals are reintroduced to the water after the treatment process. This can be a troublesome situation as you may find that your water is free of harmful elements but lacking in those minerals that are essential to your health. 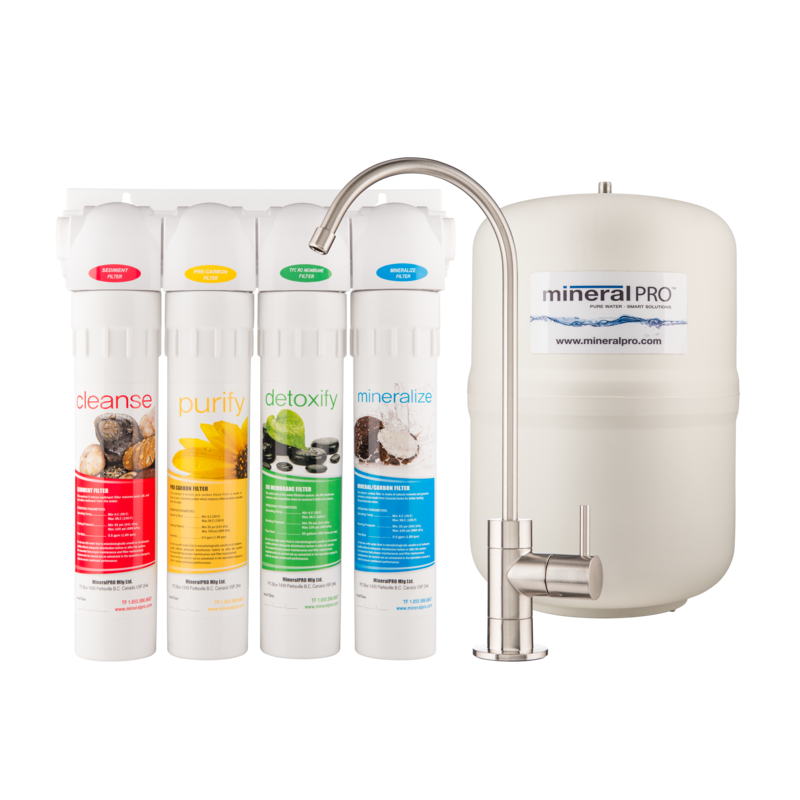 Mineral Pro takes this into consideration, however, and ensures that when you have a Reverse Osmosis filtration device installed that you also have Alkaline water with the proper minerals introduced at the proper stage of purification. What you have at the end of the process is delicious, healthy, and enriching water that you so rightly deserve. Find out more information about what we can do to make your life a touch better every time you turn on the faucet! We look forward to getting to work for you, today! Call us today at 1-855-586-6667 or order online and start enjoying your tap water with the peace of mind that comes from knowing you are drinking the best water available.